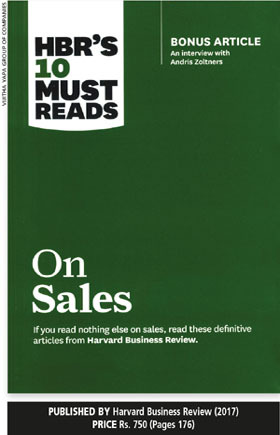 The Harvard Business Review’s (HBR) 10 Must Reads On Sales published this year is a welcome push towards a book with an attractive and affordable price. The 10 articles in it have been extracted from recent issues of HBR. Sales has been defined as not being about pushing products or being efficient but rather, building the right systems to manage and empower salespeople. The book highlights the importance of the human side of selling. As management makes detailed plans and devotes substantial resources to the sales process, it often has an incomplete understanding of the psychology of buying. Which of the following two strategies attracts more sales – pricing a product and offering a substantial discount or offering a lower (net) price? One case study cited in the book is about a graphics computer manufacturing company that priced products at 15 percent less than its competitors and offered lower discounts to major buyers. Though its prices were the lowest, there was resistance from buyers. Its management later learnt that buying agents measured themselves (and were also measured by their superiors) less by the net price of the sophisticated computers they purchased than the discounted price. So the discount held greater significance for buyers than pricing logic. The author of the above article believes that salespeople often overlook psychological and emotional factors that figure strongly in buying and selling. He suggests that the real decision makers must be identified since power doesn’t correlate perfectly with organisational rank – it must be determined beforehand how many buyers consider their self-interest. And the article analyses the battle between sales and marketing too. While salespeople believe that marketers are out of touch with what’s going on, marketers feel that salespeople are myopic. Sales are too focussed on individual customer experiences and less on larger markets. Being out of sync like this means the organisation suffers. While salespeople earn a living by closing sales, marketers focus on programmes rather than people. Under the communications banner, underperformance and complaints are common factors that should be addressed promptly. An important suggestion on how to make both factions work together is for marketers to be present at important sales calls while salespeople are allowed to preview ads and promotional material. Four factors are recommended for structuring a sales force: the different roles that should be played by internal salespeople and external selling partners; size of the sales force; and degree of specialisation as well as how salespeople apportion their efforts to selling everything as generalists rather than graduating to more specific products. When one launches a product, should new salespeople be called in or is the existing sales force sufficient? When consulting specialised doctors in hospitals in Colombo, it’s not unusual to see salespeople from different pharmaceutical companies queuing up to meet them. B2B marketing is when one business sells goods or services to another. B2C on the other hand, is where a business is selling goods or services to a consumer. With knowledge freely available on the internet these days, both customers and companies rely far less on salespeople. Therefore, salespeople are becoming adept at discerning customer needs and selling solutions – and this is mainly because customers do not know how to find solutions. This has led to the emergence of high-performing salespeople who are devising new sales strategies. In the case of a RFP (request for proposal) where companies or institutions request a presentation, a case is cited where a sales leader commandeered a meeting with his team to achieve his own ends. He distributed a written presentation for them to study but said that 60 minutes wasn’t sufficient and proceeded to tell the executives what was needed even though this wasn’t in the RFP request. The surprised but impressed executives listened with rapt attention and that sales leader won the deal, because doing one’s homework and knowing the subject exudes confidence. Tiebreaker selling is yet another area that is defined and explained in the book. Following a presentation, and when suppliers have explained their basic specifications, there may be requests for ‘something more.’ This is not for commissions but as a justification to purchase that particular product instead of another offered by competitors. Overall, the book offers valuable insights and advice on sales that are worth reading, studying and applying – by small companies and large corporations alike.